1) Madonna has sold more than 200 million records worldwide. Do you have any of her songs on your iPod/mp3 player/phone? I have her recording of Santa Baby on my holiday playlist. Other than that, I'm really not a fan. 2) When she first arrived in New York in search of fame and fortune, Madonna supported herself by working at Dunkin' Donuts. What did you order last time you were at Dunkin' Donuts? Love the chocolate eclairs! 3) Madonna and her first husband, Sean Penn, ended their marriage on New Year's Eve, 1988. Sam's New Year's Eves are never that dramatic. What about you? Do you have any vivid New Year's Eve memories you'd like to share? 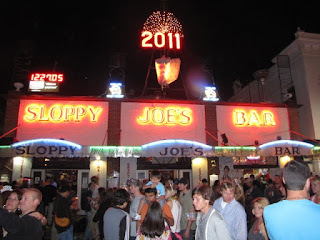 My first new year's eve in Key West, I watched the shell drop at midnight. I'm glad I did it, because it's a very conch thing to do. But it was an unruly crowd -- I was literally sprayed with champagne -- so I'm also glad I know not to do it again. 4) Madonna admits she suffers from brontophobia, aka the fear of storms. Are you scared of thunder and lightening? Nope. 5) Onstage during the 2015 Coachella fest, Madonna shocked the audience by planting a kiss square on the lips of much-younger rapper Drake. What's something that surprised you recently? I gave a big presentation on Thursday and before we got started, our client approached me and hugged me. "Gal's here!" I was surprised. It lifted my spirits, of course, and probably made me even better in front of the group, but I was surprised by the demonstration. 6) More recently, Madonna was at the center of a controversy because Prince fans didn't like her tribute at the Billboard Music Awards. They made themselves heard on social media. Was your last Facebook post or Tweet positive or negative? Neither. It was sad. A former coworker is going through a bad time and I just expressed by support for her and her family. 8) When she was growing up, Sam's father was often away on business. He always remembered to bring back the complimentary shampoos, conditioners and lotions from the hotels where he stayed. When will you next stay in a hotel (or motel, bed-and-breakfast or Airbnb room)? In August, when I get together with my oldest friend to celebrate her birthday. 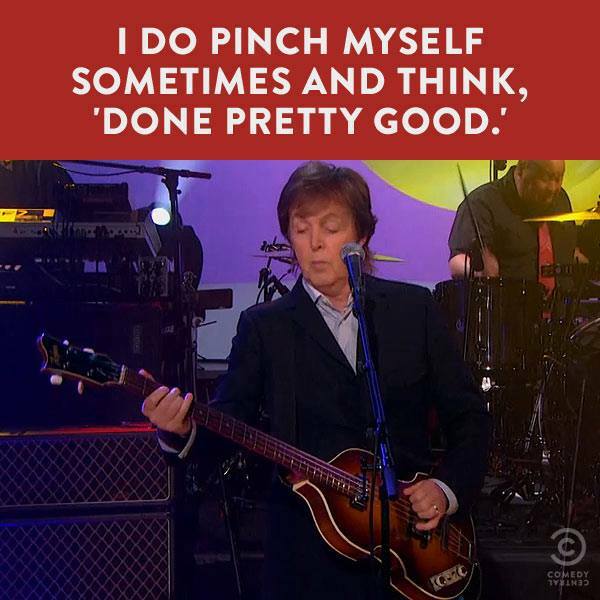 Today is James Paul McCartney's 74th birthday. He's spending it on the road, playing 2-hour+ outdoor arena shows in the summer heat. I am in awe. I've been at those shows and am exhausted when they're over. I don't know how he does it. But I'm grateful he still can. Before Muhammad Ali's death, I read that -- along with Barack Obama -- Ali and Sir Paul were the most recognized men on the planet. Looked at that way, he really has no peers. But I found myself thinking of His Lordship a lot as I read the two wonderful, massive Sinatra biographies by James Kaplan. Frank Sinatra is certainly his peer. In addition to an astonishing and genuinely moving musical and film career, Frank Sinatra had a tempestuous personal life, littered with a staggering number of lovers and exploded friendships and brushes with the Feds over his mob connections. Elvis is certainly his peer. And Paul's greatest single musical influence. The only King America has ever produced. Dead at 42, Elvis was also a genuine American tragedy. There's John, of course. Paul's friend and partner. Yin to his yang. Murdered at 40. But even if John hadn't stopped to sign that autograph on that December night more than 35 years ago, do any of us believe he'd still be on the road, making new music and thrilling new generations of fans? I'm afraid I don't. Like Sinatra and Elvis, John was plagued by demons. Rages and addictions. An estranged son. A battered ex-wife. A weakness for women, for groupies, for flatterers. Like Sinatra, John Lennon had a sharp intellect, an insatiable curiosity, and perhaps too great a sensitivity to easily deal with this world. And then there's Paul. Married 29 years to The Lovely Linda. At her funeral -- after a grueling battle with cancer, after decades together, after raising four children -- a tearful Paul said, "She was my girlfriend. I lost my girlfriend." I find that enormously touching. Now married five years to Nancy. Even during the tabloid circus nightmare of his marriage to Heather Mills, there were never rumors of infidelity. His four adult children are all out in the world, living artistic and productive lives. He is a grandfather. He's avoided the addictions and promiscuity that bedeviled Sinatra and Elvis and John. In addition to the songs that have become anthems of love for generations, he has exhibited a strength of character that deserves attention and applause. Happy Birthday, dear Paul. Happy Birthday to you. And, please, many more.